Big Agnes decided to try something completely new on this one; Build a tent with no zippers. This makes a lot of sense considering the zipper is usually the first point of failure on a tent. They get constant wear, and most people don’t clean them at all properly. Also, zippers are noisy, bulky, get hunk up on the fabric, and add weight to a tent. Now, the question stands. Does a tent without zippers even work? The Fishhook series is comprised of ultralight tents, with the Fishhook UL 2 (reviewed) only weighing in at a trail weight of 3 lbs, 3 oz. The tent is built from DAC Featherlight NSL poles silicone treated rip-stop nylon fly and floor, and a nylon/polyester mesh tent body. The tent is 93 x 57 inches, with a single 9 square foot vestibule and door, and stands 38 inches tall at its peak. there are two large vents atop the tent to fight off condensation. 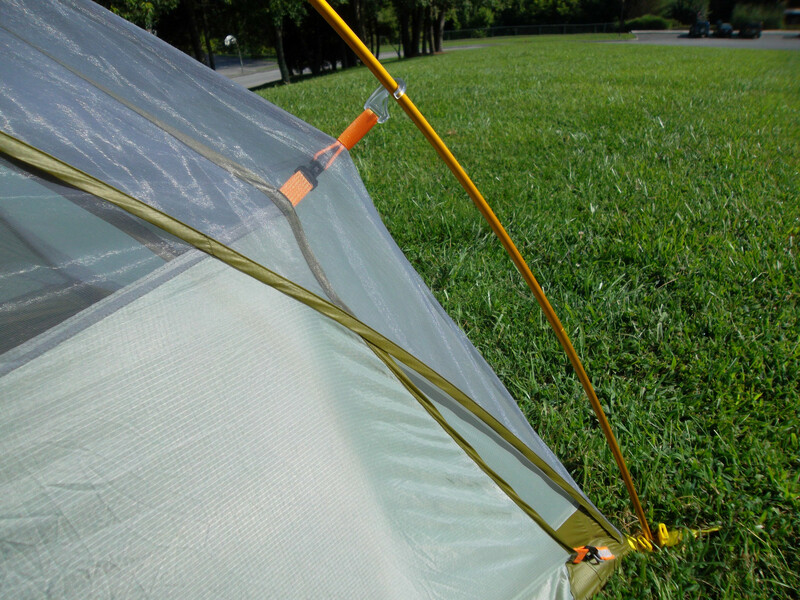 The tent ditches zippers by using a clever system of clips, and hooks. The vestibule closes by clipping to the tent poles, and at the bottom of the tent. The mesh door closes within a double overlapping mesh contraption by hooking onto the tent body itself, and again twice along the tent floor. The Fishhook 2 rings up at 399$. 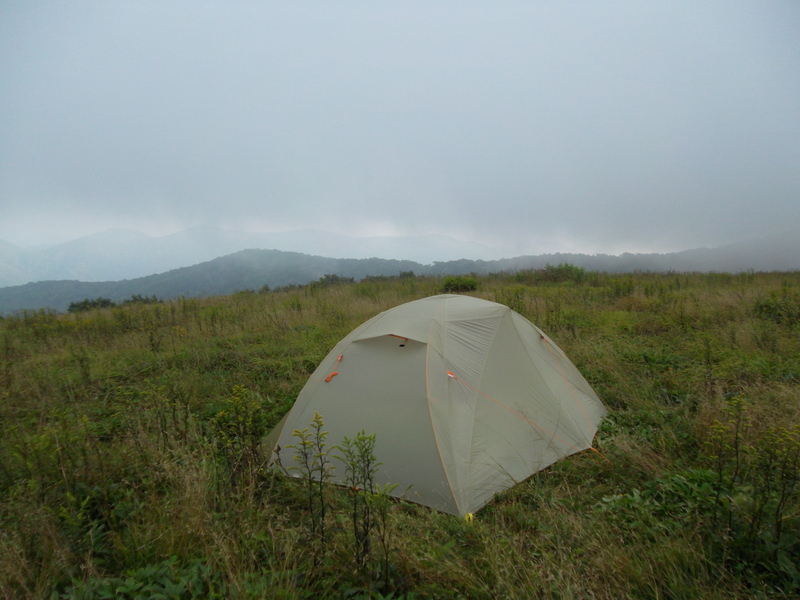 I was quite impressed with how the tent held up during a long 6 hour rain storm at 6000 feet high atop Big Bald, NC. We were completely exposed on the top of the mountain, with 20-30 mph winds drilling the tent on the broad side (the worse angle possible) of the tent, with hard sideways rain bombarding the tent for hours. It was one of the worse rain storms I’ve been in. The tent didn’t budge. There was no sway, and absolutely no flapping. This was one of the most rigid tents I’ve ever test, especially impressive being an UL. We stayed completely dry, and condensation free all night, despite being inside the clouds themselves when we woke up. The zipper-less doors work surprisingly well, and were quite entertaining to test. Clipping the door and vestibule doors closed was simple, for the most part. Getting in and out of the tent was quick and easy. The materials the tent is built from are light, and very durable. I tested the Fishhook without a foot print, pitched atop sticks and bushes, and never once worried about it punching through. The tent pitches fast, and easily even solo. There is a ton of room inside, the roomiest UL tent I’ve tested. Two testers could completely extend their arms to the sides while sitting up without touching teach other, or the walls. There is a very neat half moon gear loft built into the roof, with ample gear pockets all around. the vestibule offered enough room for both of our backpacks, boots, and all of our cookware. The tent uses the fantastic J-Stake tents stakes, and everything is color coded for simple setup. There was one clip that is difficult to close on the vestibule. It’s what I refer to unofficially as the “storm clip” which is a full on buckle style clip that buckles the vestibule to the tent body at the ground, providing rigidity and tautness to the door . It’s only necessary to buckle if you’re in strong wind, a storm, or just want extra security when closing shop for the night, but it’s a reach to get to and generally requires two hands to clip. It’s simple to unbuckle, but a little tricky to clip back. The clipping mesh doors works well, but we did get a couple tiny critters in the tent . No more than I usually get using zippered doors; however. I had admittedly not clipped the lowermost clip on the mesh door shut. Having only one door is a minor quibble, but relevant if the occupants are frequently entering and leaving the tents. Being the one in the back of the tent, and getting to that far clip on the door takes finesse. Despite having a couple small complaints, the tent is still competing with the Copper Spur 2 as my new favorite ultralight tent. The massive amount of internal room, impressive foul weather performance, and light weight is hard to compete with. Having no zippers offers up instant conversation fuel around the campfire, and silent entry and exit for those late night pee breaks; not to mention added longtime reliability. At 399$, it’s a great value for an ultralight, roomy package. Perhaps not for those who live in super heavy mosquito territory, but otherwise, a fantastic tent. I was going to ask if it’s bug proof, but you finished your review saying it’s not. Still, a very cool idea! After your experience in the driving rain and heavy winds, would you use this tent in a snow storm? It’s pretty close to being bug proof. If pitched properly you shouldn’t have any problems. That’s a different situation, but I would say as long as the snow doesn’t exceed 3 inches, it should be just fine. The frame is very strong, and actually resists even pressing down against it with several pounds of force. Hey! I enjoyed reading your review — it was helpful. I wanted to follow up by asking about your verdict about the bug situation. It seems like (from your video) you’ve camped in the NC mountains; at lower elevations, there’s quite a few spiders and ants. 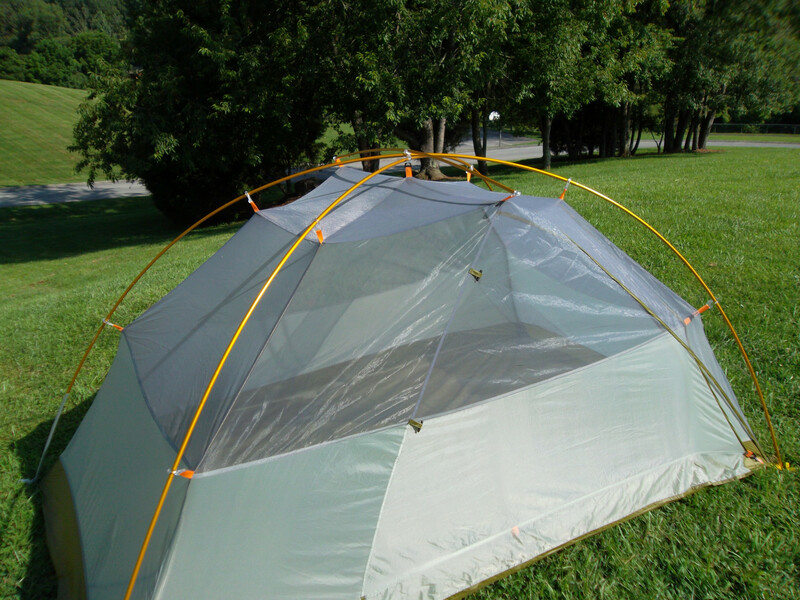 Have you used the tent in warmer climates now where insects are more prevalent? Any issues with them getting inside? Great question. I didn’t really notice any more bugs than usual getting inside. It does pretty well at keeping them out. You’re much more likely to have them come in as you enter our exit. It should do just fine if you’re looking to avoid zippers. Separate topic — does condensation form inside the tent in humid areas? Great question. The bottom works via a simple flap overhang. It’s not the triple layer like above. It does a good job of keeping the critters out as long as you’re not sleeping against it, which pushes it open. As far as humidity goes, any tent will gain condensation if it’s humid. Especially where i live. All tents get soaked. But, if the humidity is light this tent will do a great job of minimizing the effects. 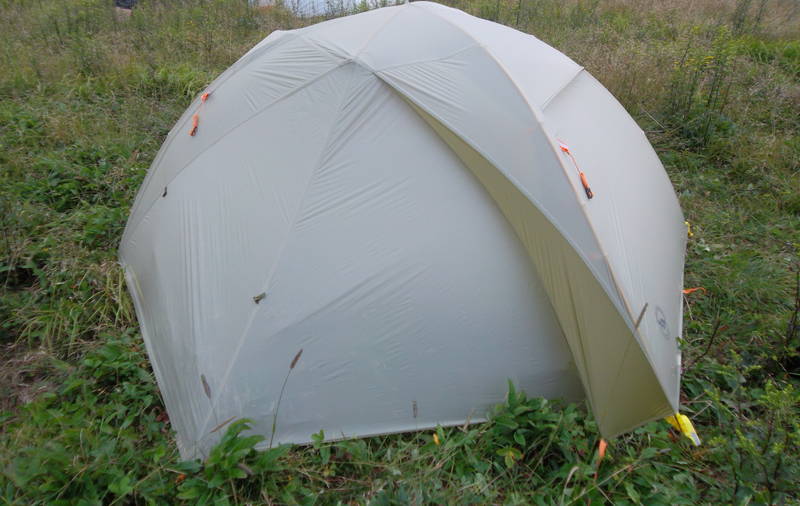 It’s one of the best ventilated tents available. I recently purchased the Big Agnes Fishhook tent and took it out for the first time this weekend. The weather was perfect, so I was not able to see how the tent holds up in strong winds or rain, but your review is promising. So far I love the tent, but I am a little concerned about things crawling inside. I noticed your review is a couple years old. I was wondering if you have experienced any visitors that are more unwelcome than mosquitos? Thanks for checking out my review. It’s still performed very well. As long as you pitch it will and stay off the wall just the occasional fly might sneak in. They’re both similar tents as far as build quality, but the fish hook is minus one door and zippers. I recommend the copper spur, as it’s an excellent tent, but either tent would be great. It looks unusual but I think it’s worth a try. It’s a fun shelter. It may be getting harder to find these days though, as it’s not being manufactured at the moment.